I’m now south of Stewart Island and have made the turn to pass below it between South Trap and Snares Island. This course will take me into the Tasman Sea and with any luck I will be there in a few days. 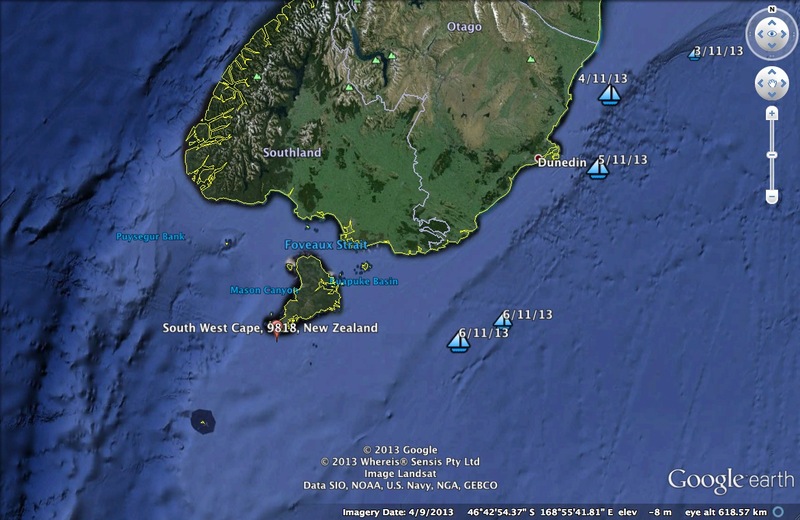 I will also be sailing under the first great cape, South Cape on Stewart island. This is a big moment for me and the voyage. Thank you Ron Kolody for your guiding weather reports. And MaryLou, the love of my life, thank you for being there 24/7. Your love has given me strength and courage. Wow what an incredible journey you are on! Truly amazing to read your blog posts. Keep trekking and good luck. Keep up the fantastic work. Your daily posts are a source of inspiration to those of us that are stuck here toiling on land. All of us here at SCYS are drooling over your daily posts and are constantly inspired by not just the facts of your amazing voyage, but the incredible poetic skill with which you convey them! Continued success to you and much thanks to Mary Lou for keeping the world in the know! Congrats on the first cape Glenn. Keep stormin’ along – we are with you. It is hard to believe you have already rounded the first mark in your journey around the world, congratulations!! We will continue to look forward to reading your daily reports and hope that your hand is much improve. Well Glen. You just have to keep a few points to Starboard, then turn R again, and you will be on your way home. I have a friend in Christchurch who is following you, and we were talking about the challenge in the Chartroom today. Well done Glenn. You are awesome. You are a daily beacon, showing up on our emails. Your dialogue helps us escape the dark and damp and cold! Round the first mark – wow. Gives me a great appreciation for both MaryLou and Glen and their family for being so open and we wish them only well. Go on Glen, fill full your dream! Your family is definitely behind you! I love reading your progress and am a real fan of yours……..babi P.
Wow, Glenn, so great to hear about you chatting with Claire. Very exciting that you are rounding the first Cape. You are definitely moving into the big leagues now. Thinking of you often sending positive vibes with you all the way! Hey Mark Thanks for your nice note. I’ll send it off to him. Means a lot to him. Congratulations on passing under your first milestone and thanks for your wonderful and informative posts.